As many of you know, July 3 was our 1 year wedding anniversary! To celebrate, we ate at Oceannaire, an absolutely amazing seafood restaurant in downtown Indianapolis. I definitely recommend this place if you are into seafood. They have a raw oyster bar, with oysters from several different places. They have specials that change frequently (possibly daily) and all their seafood is flown in fresh. They also went all out for our anniversary, giving us an anniversary card, personalized menus and a free flaming ice cream dessert. It is a bit expensive, so maybe best saved for special occasions. After dinner, we ate our cake top. 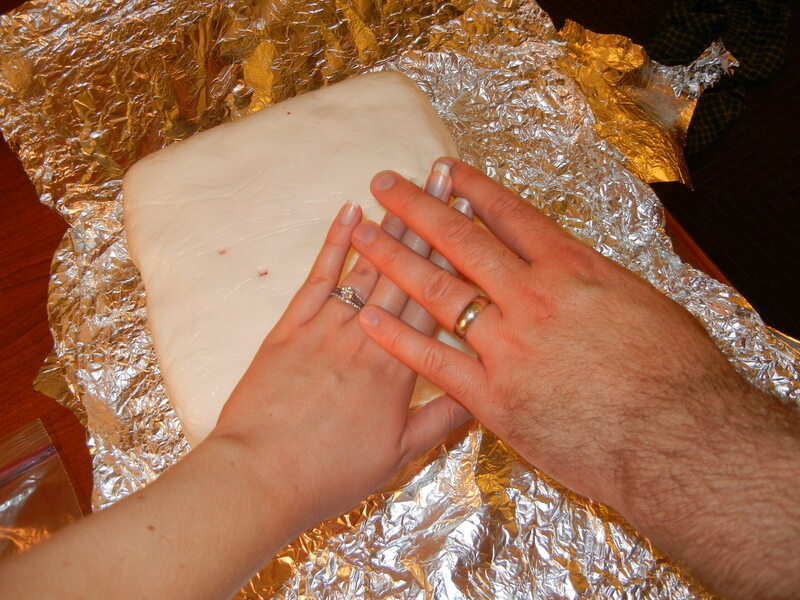 The outside was a bit stale, but the further toward the center you got, the better the cake got. 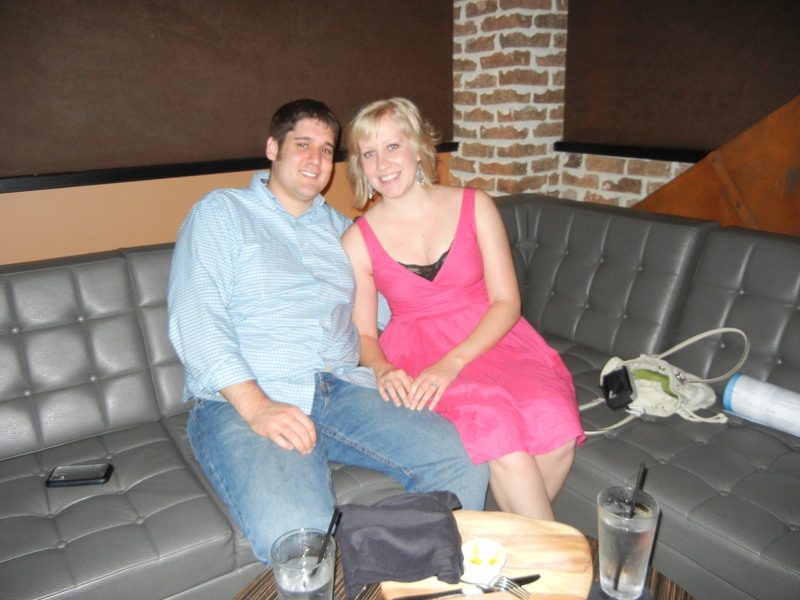 We also went to the Ball & Biscuit, a really neat Mass Ave. establishment. The drinks there are also a bit expensive, but they only use top shelf liquors and the drinks are fairly strong. The high quality of the liquor make the strength not only tolerable, but enjoyable. They have quite a few signature cocktails, which are their specialty, and they make all of their own syrups, so everything tastes great. One drink at the Ball & Biscuit is worth more than 3 drinks at a cheap college bar and the decor and vibe are really great, too. We also got a couple of the cheeses they offer, which were also amazing. For the 4th Paul and I decided it would be fun to grill, as is tradition, but weren’t in the mood for hamburgers and hot dogs. Instead, I made up this recipe, and it turned out pretty awesome (if I do say so myself) so here it is! The breasts turned out a little dry, but I’m going to go ahead and decide to blame the dead battery in our meat thermometer for that one (because it’s my blog and my cooking and therefore I can do that). Rub whole chicken with spice rub made with salt, pepper, paprika, cayenne pepper, a bit of nutmeg for good measure and a touch of brown sugar. Rub the mixture under the skin. Also pour some Frank’s between the skin and the chicken. Cut the top off of a beer can and pour out (or drink) about 1/4 of the beer. 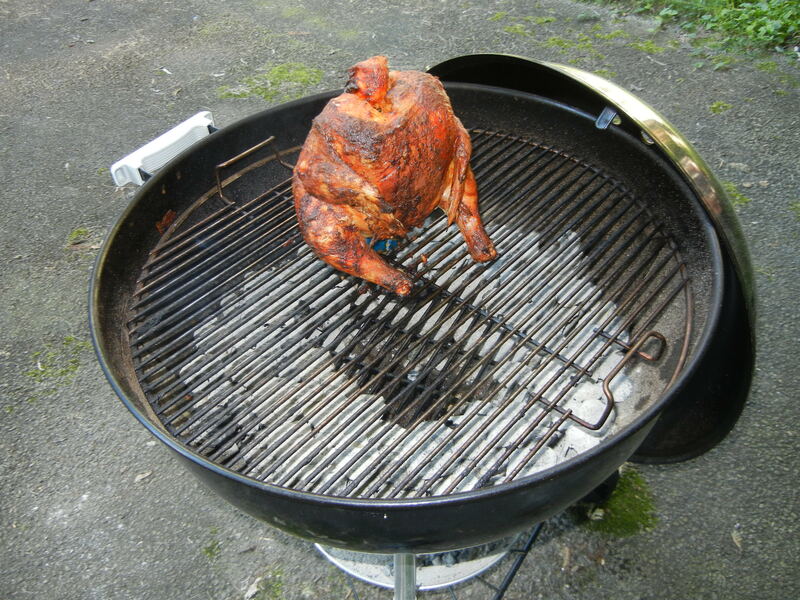 Put the beer can inside the chicken. 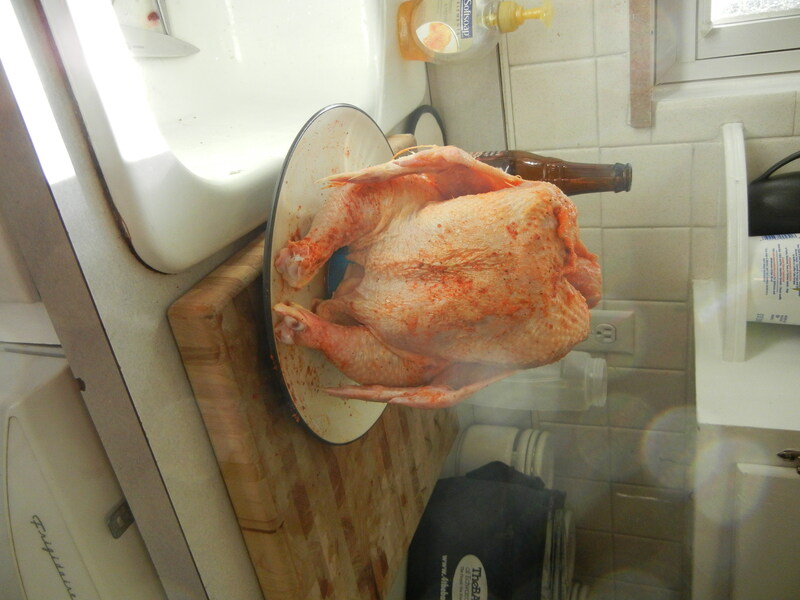 Cook the whole chicken for about 1 hour and 15 minutes in a hot grill with the lid on. Baste with buffalo sauce (1/2 cup Frank’s and 1/3 cup melted butter) around 45 minutes in. Use about 1/2 cup to baste and the rest to dip the chicken in when it is finished.